gives assistance and shelter to millions of people forcibly uprooted from their homes. Some of them have lived in camps or ghettos for up to 20 years. The upcoming World Refugee Day on 20th June is an important opportunity for everybody to show solidarity. Marie is a Burundian refugee in Rwanda. As a member of the Tutsi ethnic group, she and her family were attacked by Hutu rebels on several occasions. Now she and her family are waiting to be resettled; as she says, "I plan to work and start over my life with my family. It’s the most precious dream I have… to see them again." 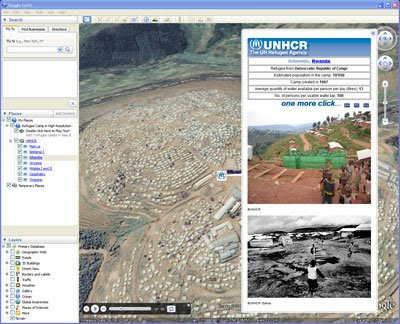 Together with Google, UNHCR is putting refugees on the map - a virtual map - with a new Google Earth tour that shows UNHCR's refugee camps across the globe. Claudia Gonzalez-Gisiger from UNHCR says the tour is a powerful way for everyone to get an insight into the desperate conditions in which refugees live. The Google Earth tour, set to the Rolling Stone's classic track Gimme Shelter, kindly donated to UNHCR by ABCKO as part of the organization's flagship Gimme Shelter Campaign, gives a human face to refugees from seven different camps across Asia and Africa, allowing you a small insight into the lives of refugees like Marie. Documenting and mapping refugees can help focus public attention on human rights issues worldwide, and hopefully provide a voice for persecuted children, women and men. Every year, the United Nations High Commissioner for Refugees (UNHCR) gives assistance and shelter to millions of people forcibly uprooted from their homes. Some of them have lived in camps or ghettos for up to 20 years. The upcoming World Refugee Day on 20th June is an important opportunity for everybody to show solidarity.